Indian External Affairs Minister Sushma Swaraj, in her address at the 15th Ministerial Meeting of the BIMSTEC here, also said that the grouping is collectively working on strategies to counter the scourge of terrorism and violent extremism. 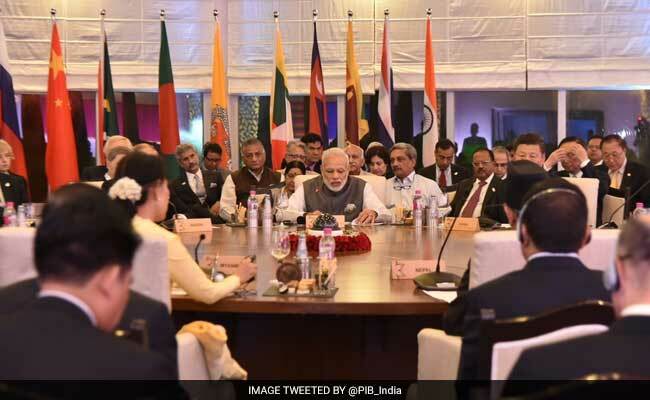 Kathmandu: India on Friday said that that the Bay of Bengal Initiative for Multi-Sectoral Technical and Economic Cooperation (BIMSTEC) regional bloc was a "natural choice" to fulfill New Delhi's key foreign policy priorities of Neighbourhood First and Act East. She referred to the first meeting of BIMSTEC national security chiefs in New Delhi in March 2017 and said that it "adopted a holistic approach to tackle traditional and non-traditional security challenges, that threaten our region". "We worked out collective strategies to counter the scourge of terrorism, violent extremism and transnational crimes, as also to strengthen our maritime and cyber security cooperation," she stated. "Specific follow-up measures in these areas are now under progress." Ms Sushma Swaraj said that for India, BIMSTEC was a natural choice to fulfill New Delhi's key foreign policy priorities of Neighbourhood First and Act East. Stating that enhanced connectivity was vital to achieving BIMSTEC's common goals of growth, employment and prosperity, she said: "To achieve smoother cross-border flows of trade and people, we need to put in place the enabling soft infrastructure such as the Framework Agreement on Transit, Trans-shipment and Movement of Vehicular Traffic and the Agreement on Coastal Shipping, at the earliest." She said that intra-regional tourism got a boost with the launch of the BIMSTEC Network of Tour Operators recently in New Delhi which brought together industry and stakeholders from across the region. "Promotion of intra-BIMSTEC tourist circuits, joint marketing strategies, and BIMSTEC specific tourism products, notably the Buddhist circuit, would allow tourists to experience our rich and shared civilizational heritage," she outlined. As for disaster management, Sushma Swaraj said that the BIMSTEC region was vulnerable to a variety of disasters due to its geo-climatic conditions. "This will help us develop quicker, coordinated and comprehensive responses to disasters, and provide timely relief and rehabilitation." Describing energy as the engine of economic development, she said: "I am happy to note that cross-border exchange of power between India, Nepal, Bhutan and Bangladesh is on a rapid upswing. The BIMSTEC MoU (memorandum of understanding) on Grid Interconnection, which has been finalised, would further facilitate regional energy trade." The Indian Minister also referred to her country's ambitious programme to harness renewable energy and called for building a strong renewable energy partnership among the member states of BIMSTEC "to tackle climate change together, for a greener world tomorrow". Pointing out that BIMSTEC has a combined GDP of over $2.85 trillion, Ms Sushma Swaraj said: "There remains however an immense unfulfilled potential for deeper economic integration. Along with the work on BIMSTEC FTA (Free Trade Agreement), the BIMSTEC Trade Facilitation Agreement and the BIMSTEC Agreement on Mutual Assistance on Customs Matters would fasten trade, and must be concluded at the earliest." In the area of public health, she said that India's premier medical institute, Jawaharlal Institute of Postgraduate Medical Education and Research (Jipmer), has launched the BIMSTEC Tele-medicine Network that brought together 10 top hospitals and medical institutes in the region to provide cutting edge tele-medicine services. "The BIMSTEC Task Force on Traditional Medicine would be meeting in India in October 2017 to strengthen the role of traditional medicine for holistic health care," she added.